The crèche culture is of Western origin. It has not spread widely to the region where Christ was born. Palestine created the well-known olive wood sets, but has also the even more exquisite nativities with figures clothed in fabric. Christian arts and crafts of Upper Egypt gave us beautifully fashioned ceramic figures, tall and slim, with characteristic features of the region and mostly bearded faces. Their message lies not in many details but in the posture of the body, the gesture of the hands and position of the head. The whole scene is a symphony of reverence, silent adoration and sightless eyes (the eyes of all the figures being closed). Broken upon arrival from Egypt, most of the figures had to be mended. There lies some symbolism even in this: over time the story of Christ's birth has been broken and mended many times. Sometimes it was the sender who lacked attention, sometimes it was the recipient who became careless. 12 piece hand-sculpted ceramic figures, glazed and fired, created by Ausa in the small town of Garagos in Egypt. 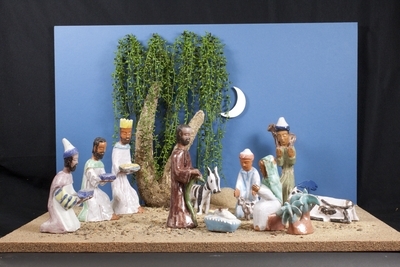 The figures depict Mary, Joseph, infant Jesus, three kings, shepherds and animals. Exhibition label written by Father Johann G. Roten, S.M. originally for exhibition entitled "African Symphony" held at Roesch Library, University of Dayton.